Saturday my squishy adorable snugly strong willed little baby turned 7! I’ve seen beautiful rainbow cakes all over blogland, so I decided to try my hand at a Neapolitan one just for Kinz. I think it turned out quite cute if you ask me! 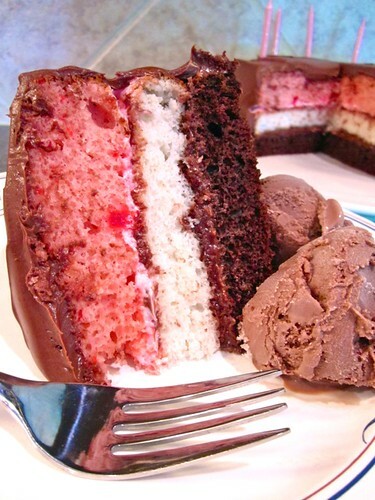 I just used 3 boxes of Betty Crocker cake mix; a strawberry, white, and dutch chocolate. I also used Betty Crocker chocolate icing (2 tubs). I’m not usually one to spend so long on a cake, but how could I say “no” to our little princess (the answer is, I can’t). Kinsey thoroughly enjoyed helping me make the cake, and then eating it afterward. 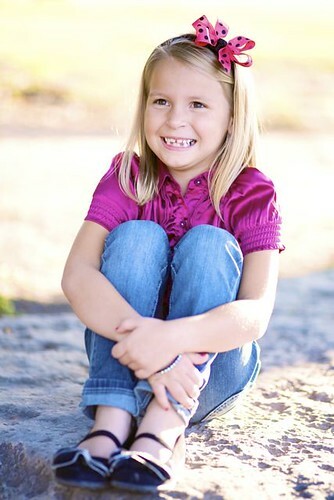 Happy Birthday my BIG 7 year old! What a beautiful picture! I love her big smile 🙂 And way to go mom on that cake! Looks delish! 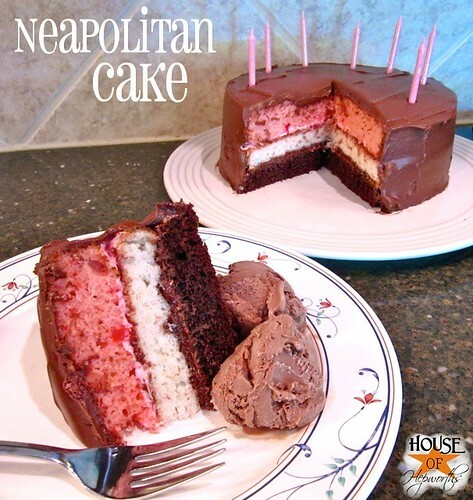 Neapolitan cake – how clever! Looks like a great birthday for your cutie. She looks very happy and a lot like her momma too. 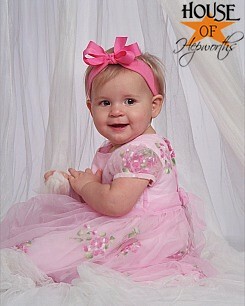 They grow up so fast in the blink of an eye she will be in high school, savor these days. What a yummie looking cake, now why can’t you just make a box cake? Ya know, your makin me look bad. Projects, home improvment, crafts, busy with young kids is there anything you don’t do?? Yummy! What a fun variation on the rainbow cake. It is a fair amount of work but they look so neat when you cut into them. I like to call it the surprise cake! Happy birthday to your baby girl! Allison, I’m drooling over this cake! YUM! I need to not be on a diet, dangit! Pshh. Love the cake! I am the same way with my kids. All three of them get everything they want. My oldest is turning 7 next Tuesday and we are celebrating this weekend with a watermelon themed birthday party. We are having watermelon flavored cupcakes and everything pink and lime green. She also wanted an American Girl doll; however, my co-worker bought her daughter a What A Doll from K-Mart which looks just like the American Girl doll but its about 1/3 of the price. My daughter saw it and thats what she wanted. So that is what she is getting with an outfit and some jewelry to go with it. The outfits come with an outfit for the child and an outfit for the doll and the jewelry is the same way. It also has an online community. Happy Birthday to your daughter!! YUM! I LOOVE cake. It’s my weakness, I admit it! And the one you made looks amazing! She’s a beautiful young lady…and what a delicious looking cake you made. Happy Birthday to her!